Potato Fufu is a tricky one to make because Irish potatoes do not contain enough starch to make a mouldable fufu meal. But I will show you how. The recipe detailed on this page will show you how to make Potato Fufu from fresh Irish Potatoes. You can use sweet potatoes instead of Irish Potatoes but sweet potatoes are too sweet for a fufu meal and some people with authentic Nigerian tastebuds may not like it. If using sweet potatoes, click here to follow the pounded yam recipe. 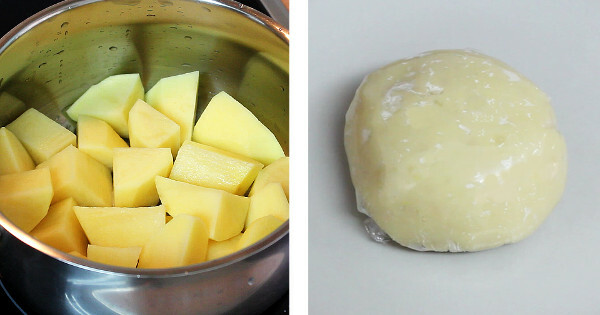 Peel the potatoes, cut into cubes and rinse. Put in a pot, pour water to cover the potatoes and start cooking on medium heat. Mix the flour with the hot water till a sticky dough is achieved. Mould the dough into small balls and set aside. When the potatoes have boiled for about 12 minutes, add the balls of dough and continue cooking till you can easily drive a knife into the potatoes. Decant the water into a bowl and set aside. Pound/mash the potato and ball of flour either with a potato masher, a blender, a mortar and pestle or a stand mixer till a smooth dough is achieved. See the video below. That's it! Serve immediately with your favourite Nigerian Soup.